You may think your snake prefers your presence over the presence of another person, but it is highly unlikely that snakes can actually differentiate two people. Unlike dogs, cats, rats and birds, snakes simply do not have the right type of intelligence to recognize one specific human from another. 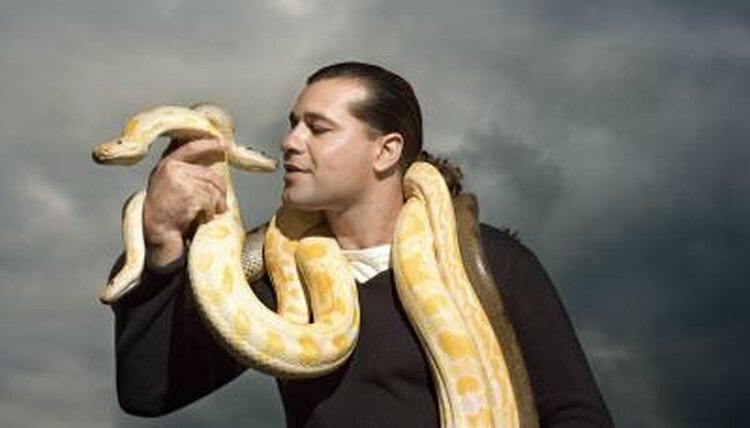 However, snakes can be conditioned into tolerating human contact, which may create the illusion of recognition and differentiation. Snakes have six senses. They possess the standard five senses that humans have -- sight, smell, hearing, touch and taste -- and the ability to detect the heat of other creatures without touching them. This enables snakes to identify potential prey from a distance. But their sight and hearing are not developed to the same level as they are in typical pets. Snakes have poor eyesight. As ground dwellers, they never developed the ability to see long distances. Their hearing is based on vibration, not sound. Snakes do have good smell and taste. But whereas a dog may recognize his owner’s scent in an instant, snakes wouldn't. Their senses aren’t wired that way. Snakes are excellent at using their tongues to detect the smell and taste of air particles given off by a particular organism, but they use this sense to decide whether something is a potential meal or not. Even if a snake had the requisite senses to identify and differentiate between people, she doesn’t have the mental capacity to process this information into a pattern of recognition and determination. While a snake is capable of identifying a familiar scent, the snake has no concept of being a pet and therefore cannot identify the difference between owner and potential prey. Rest assured: Since most pet snakes are not capable of consuming anything human-size, it is rare they will attempt to feed on a human. It is understandable that it may appear to some people that their snakes can identify their presence and potentially determine between them and another human, but it is unlikely to be true. What is more likely is that the snake has been conditioned to tolerate human contact -- and the person most likely to have conditioned the snake is the owner. Put another way, the owner may know how to put the snake at ease, resulting in the snake ignoring her natural instinct to flee or strike. But someone unfamiliar with the snake may act differently, causing the snake to flee or become defensive. Conditioning is the reason why snake charmers are able to interact with their snakes in ways that should, in theory, cause the snake to react defensively. Can Pet Rats Remember Their Owners After a Long Absence?